Hello. I am a music art healer. I go around the world to spread a cycle of Light and of Love among people in Japan, Australia, America and Holland. I have planted seeds of Love in those places and helped them to grow. My goal is to help people so that they feel happier and can live with a big smile on their faces, and achieve their goals. Everybody has a beautiful soul. We are children of Light. I hope everybody can shine as they live. My father's sickness gave me a reason to learn healing. My father had bladder cancer and I wanted to help him. So I researched a lot of options. And so I discovered Guided Image Training, and later , Reiki. I am proud that I could help prolong my father's life using these techniques. I learned Tai Chi and Chi Gong when I lived in SF. I learned the Nishino Breathing method by studying with Mr. Nishino, who is the founder of the Nishino Ballet Company. Yoga is also an important part of healing, and I have studied it with several teachers for more than 20 years. And I have been doing Zen meditation for most of my adult life. When I go back to Japan I visit Zen temples in Kamakura and Tsurumi. 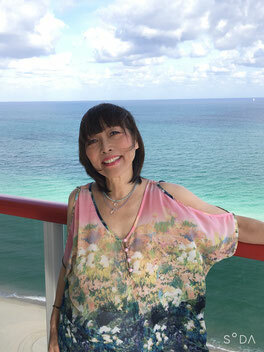 I learned Angel Healing with Makiko Gonzales in Sydney who studied it with Doreen Virtue Ph.D. I received psychic training from Mr. Gonzales, the husband of Makiko Gonzales. I received my Usui Reiki Master degree from Rumie Aino in NY. I learned Theta Wave Healing with Ms. Mariko Blanch in Sydney. I am a practitioner of Oneness Healing. I have also started healing traumatized pets. "Hands on Healing" and "Voice and Sound Healing" are my original healing methods. I have created them over the past 7 years based on my studies and experience. I asked my mother if I could study piano when I was 10 years old. My teacher was Tomoe Kowatari who is also a professional singer. Later, I studied piano with Rusela De Villena Liebgold who graduated from the Julliard School of Music in NY. She is a concert pianist. And I learned piano technique from a piano teacher who teaches injury-free techniques to Musicians. I learned improvisation with a Music therapist in Sydney, and I started to compose music in 2009. When I compose music, I have a wish that every note will convey Love and Hope. Music can go directly into the heart and heal it. If you think I can help you, please let me know. I wish everyone much happiness.